K2-7-veg is a Whole Food Based vitamin K2-7 derived from fermented chickpeas in the form of Menaquinone-7 (MK7). 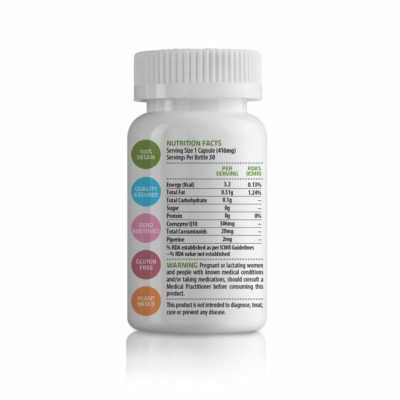 Each serving of K2-7-veg provides 100mcg of vitamin k2-7 and it’s blended with USDA organic certified spirulina. It’s 100% natural, gluten-free & vegan. What is good for our teeth is good for our whole body. That is why our teeth are a great barometer for overall health. Thus, it is not surprising that vitamin K2 has benefits for the entire body. 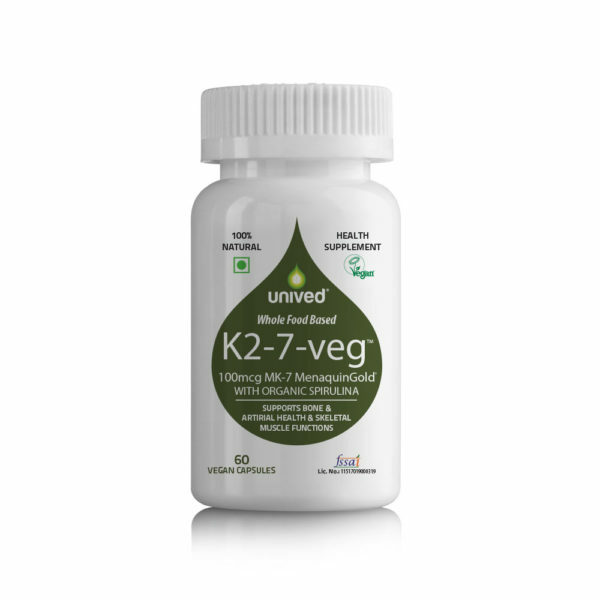 Unived’s K2-7-veg is formulated with vitamin K2 (as Menaquinone-7 (MK7)) derived from fermented chickpeas. 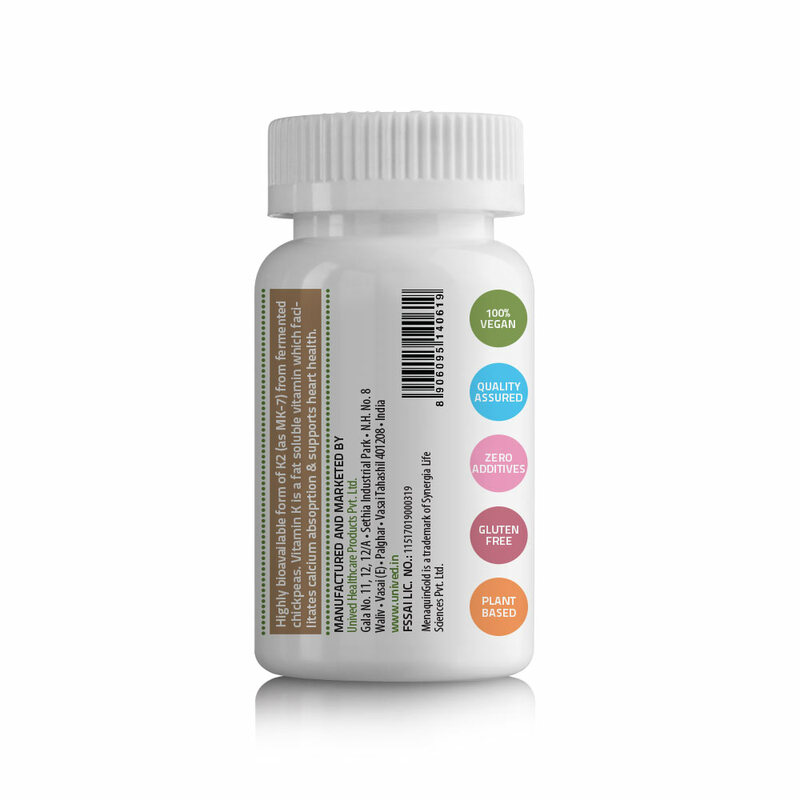 Menaquinone-7 (MK7) is a highly bioavailable form of vitamin K2. 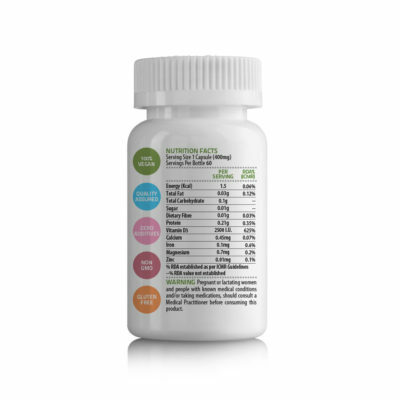 Each serving delivers 100mcg of vitamin K2-7 and 240mg of organic USDA certified spirulina. 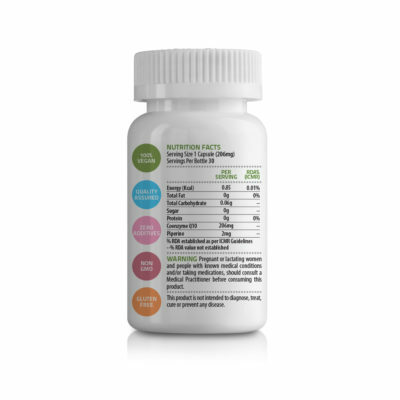 Spirulina is a potent superfood that is abundant in iron, B vitamins, and antioxidants. 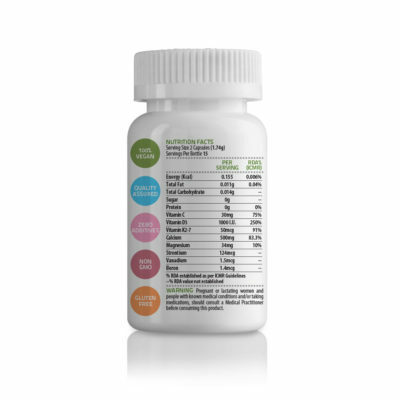 Vitamin K2-7 and organic spirulina complement each other to provide cardiovascular health & immunity support, facilitate calcium absorption and utilisation, and promote healthy ageing. Unived’s K2-7-veg is 100% natural, vegan, and non-GMO. Vitamin K is a fat-soluble vitamin that is not synthesised by the body. This makes it essential to get vitamin K through your diet or health supplements. Vitamin K’s main role is to facilitate calcium absorption, and support heart and kidney function. There are however, two forms of vitamin K: vitamin K1 & vitamin K2. Vitamin K1 is known as phylloquinone and is mostly found in plant foods like leafy green vegetables (spinach, kale, etc.). Most of us consume enough K1 through our diet. While vitamin K1 helps with blood clotting and other blood disorders, vitamin K2’s function is different and is more bioavailable than vitamin K1. Vitamin K2 referred to as menaquinone, and its main roles are to support calcium metabolism and prevent calcification of the arteries. Only some fermented foods like some cheeses and other animal products contain vitamin K2. So, if you are a vegan, your vitamin K2 consumption is nill, unless of course, you eat Japanese natto beans. Because vitamin K2 is a group of menaquinone compounds (MK), each MK is associated with unique benefits. They range from MK-4 to MK-13. Some supplements in the market use MK-4, which is synthetic and has a very short half-life in the body. On the other hand, MK-7 is the most biologically active and bioavailable of vitamin K2 by having the highest biological half-life in the body. This means it stays longer in your body, resulting in more stable levels in the body. MK-7 is found fermented natto beans, made from soybeans. Making it vegan-friendly too! Vitamin K deficiency occurs when you either consume less vitamin K than you need, or you can’t absorb enough from your diet. The amount of vitamin K that you are able to absorb from your diet is related to the intestinal bacteria that you have, so your level of vitamin K can drop greatly depending on your overall health, especially your gut/digestive health. Symptoms of deficiency include excessive bleeding that won’t stop easily, though this could also be caused by other things and should be evaluated by a physician. Although you might not be deficient in vitamin K, it is possible that you aren’t getting enough vitamin K to help prevent heart disease and bone disorders like osteoporosis. For this reason, it is important you get the appropriate amount of vitamin K your body needs. 500mg algae calcium, 34mg algae magnesium, 30mg plant-based vitamin C, 1000 I.U. plant-based vitamin D3 and 50mcg vitamin K2-7 to ensure that your bones get the right nutrition, strength, and durability. 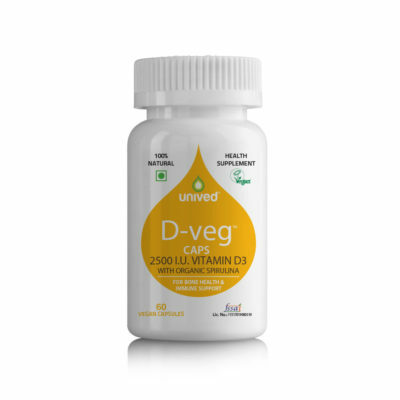 Vitamin C aids collagen formation, vitamin D3 ensures the absorption of calcium and vitamin K2-7 ensures the utilisation of calcium. CalDveg is 100% natural and is registered by the the Vegan Society – UK, and is appropriate for vegans & vegetarians. India’s leading natural Coenzyme Q10. Q-veg is a single bond, trans isomer natural fermented Coenzyme Q10 which is bio-identical to the CoQ10 produced within the body. 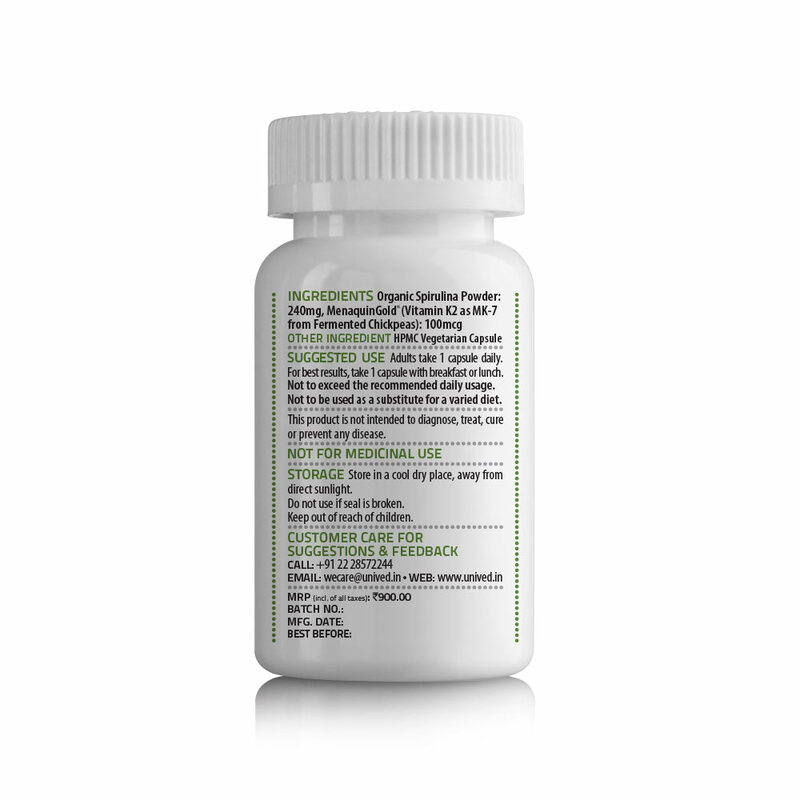 Q-veg offers 206mg pure vegetarian fermented Coenzyme Q10 and 10mg Piperine per serving. Q-veg is registered by the Vegan Society – UK, and is appropriate for Jains and Vegans. CurQ10 is India’s pioneering combination of natural Coenzyme Q10 (CoQ10) and standardized phytochemical extracts of Curcumin, which offers wide-reaching anti-inflammatory, anti-ageing, and heart protection. CurQ10 is a 100% natural supplement offering 300mg of bio-identical and highly bioavailable Coenzyme Q10, 100mg of standardized phytochemical extracts of Curcumin, and 10mg of Piperine (black pepper extract), per serving. CurQ10 is registered by the Vegan Society-UK. 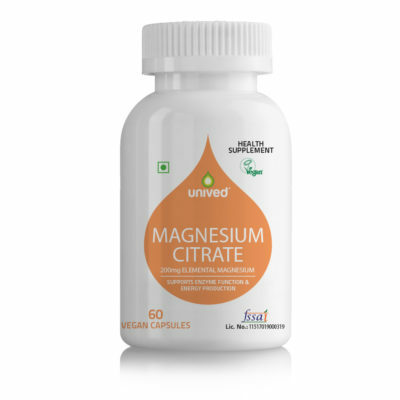 Unived’s Magnesium Citrate is formulated to provide enzyme function and energy production support. 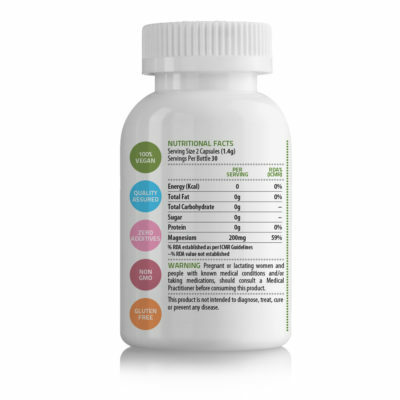 The formulation features elemental magnesium from magnesium citrate. Magnesium is also critical for bone minerallization, nerve impulse transmission, and metabolism. Magnesium Citrate is non-GMO and gluten-free. It’s also suitable for vegans and vegetarians.